This topic describes how to upgrade Ops Manager Director for Pivotal Cloud Foundry (PCF) on Amazon Web Services (AWS). It corresponds to Step 2: Deploy Ops Manager in the Upgrading Pivotal Cloud Foundry topic. In this procedure, you create a new Ops Manager VM instance that hosts the new version of Ops Manager. To upgrade, you export your existing Ops Manager installation into this new VM. Navigate to the Pivotal Cloud Foundry Operations Manager section of Pivotal Network. Select the version of PCF you want to install from the Releases dropdown. In the Release Download Files, click the file named Pivotal Cloud Foundry Ops Manager for AWS to download a PDF. Open the PDF and record the AMI ID for your region. Navigate to your EC2 Dashboard. Click AMIs from the Images menu. Select Public images from the drop-down filter that says Owned by me. Paste the AMI ID for your region into the search bar and press enter. Note: There is a different AMI for each region. If you cannot locate the AMI for your region, verify that you have set your AWS Management Console to your desired region. If you still cannot locate the AMI, log in to the Pivotal Network and file a support ticket. Right click the row that lists your AMI and click Copy AMI. Enable Encryption. For more information about AMI encryption, see Encryption and AMI Copy from the Copying an AMI topic in the AWS documentation. Select your Master Key. 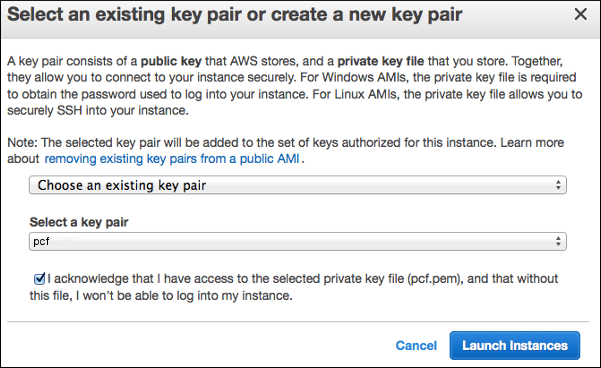 To create a new custom key, see Creating Keys in the AWS documentation. Click Copy AMI. You can use the new AMI you copied for the following steps. Select the row that lists your Ops Manager AMI and click Launch. Choose m5.large for your instance type and click Next: Configure Instance Details. Network: Select the VPC that you created. Auto-assign for Public IP: Select Enable. IAM role: Select the IAM role associated with your pcf-user profile. If you have not created one, click Create new IAM role and follow the Guidelines for Creating User Roles on AWS. For all other fields, accept the default values. Click Next: Add Storage and adjust the Size (GiB) value. The default persistent disk value is 50 GB. Pivotal recommends increasing this value to a minimum of 100 GB. On the Add Tags page, add a tag with the key Name and value pcf-ops-manager. Click Next: Configure Security Group. Select the pcf-ops-manager-security-group that you created in Step 5: Configure a Security Group for Ops Manager. Click Review and Launch and confirm the instance launch details. Select the pcf-ops-manager-key key pair, confirm that you have access to the private key file, and click Launch Instances. You use this key pair to access the Ops Manager VM. 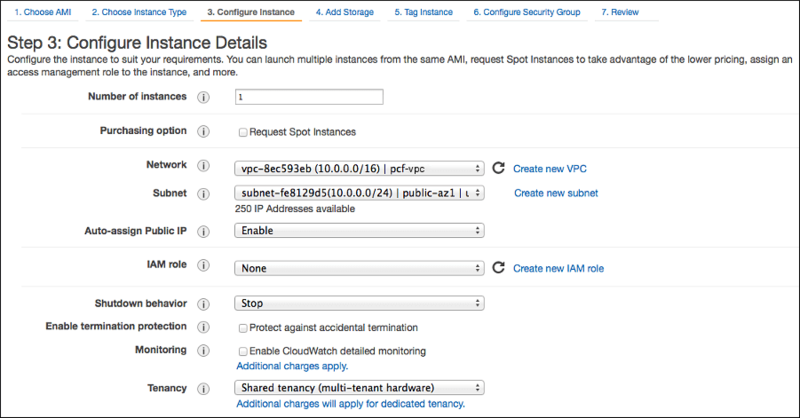 Click View Instances to access the Instances page on the EC2 Dashboard. Select the VM that you created in the previous section. Locate the IPv4 Public IP value in the instance Description tab, and record this value for use in the next step. In your DNS provider, edit the A record for pcf.YOUR-SYSTEM-DOMAIN to point to the IP address recorded in the previous step. Continue to Step 3: Import Previous Ops Manager Installation in the Upgrading Pivotal Cloud Foundry topic.